licence to use explosives (specialised purpose). If you already have a medical report for using commercial vehicles with dangerous goods, you can use this as your medical assessment. 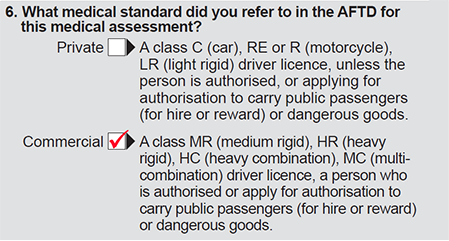 QF3195 Private and commercial vehicle driver's health assessment (or equivalent*). * An acceptable equivalent is any assessment form issued by a government agency assessing your fitness to drive. The option on form F3712 in part 1 question 3: 'a vehicle transporting dangerous goods in a receptacle with a capacity of more than 500 L or 500 kgs' – should be ticked as yes (see below). Have a legally qualified medical practitioner complete the above forms in accordance with the standards for commercial vehicle drivers. The medical practitioner must select Commercial Standards for question 6 in part 2 of form F3712 (see below). This constitutes the medical report. The QF3195 Private and commercial vehicle driver's health assessment will be used by the medical practitioner to comply with the QF3712 Medical certificate. QF3195 Private and commercial vehicle driver's health assessment will be kept by the medical practitioner for their records. This is not required to be submitted to the Explosives Inspectorate. Submit a certified copy of QF3712 Medical certificate for motor vehicle driver (completed to commercial standards) with your application. Keep the original copy of QF3712 Medical certificate for motor vehicle driver for your own records. A medical report is current if it's dated within 3 years of satisfactory assessment by the qualified medical practitioner. The Chief Inspector of Explosives may also request more information from a doctor about an applicant's physical health, or a report from a psychiatrist or psychologist about an applicant's mental health. If your health changes to the extent that you no longer meet the medical standards, you must inform the Explosives Inspectorate as soon as possible.